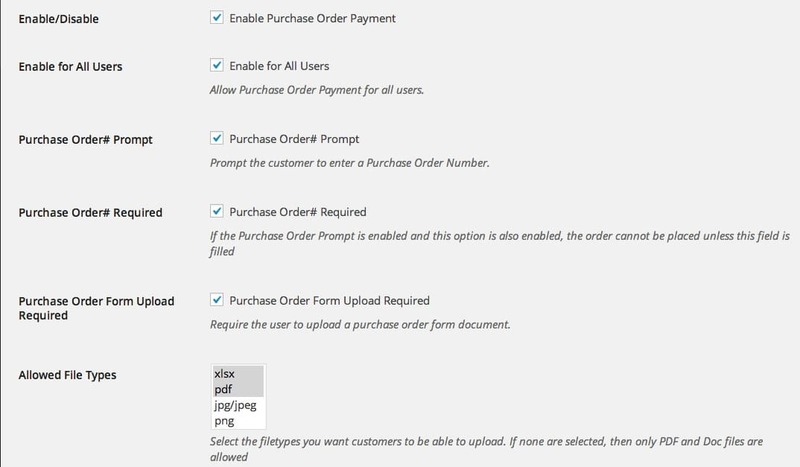 Do you need a way to allow customers to place an order before providing payment information? Maybe you need to calculate shipments manually for every order or maybe you want to be able to approve/cancel an order before the customer actually pays. Do you want to only do this for specific scenarios – like a specific product category or shipping method being used? WooCommerce Purchase Order Payment Gateway allows you to separate the checkout process from the payment process to give you more flexibility with your WooCommerce shop. Got questions? Use one of the contact form below! 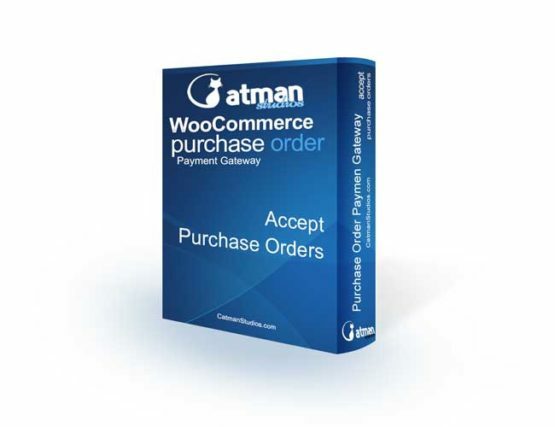 We have a demo here: WooCommerce Purchase Order Demo. Send us a message for an admin login. 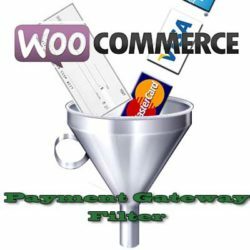 This is an intermediary payment gateway, which allows your customers to checkout without having to provide payment information. This can be useful if you want to use WooCommerce to provide quotes or if you have items that for one reason or another require manual shipping rate quotes for each order. 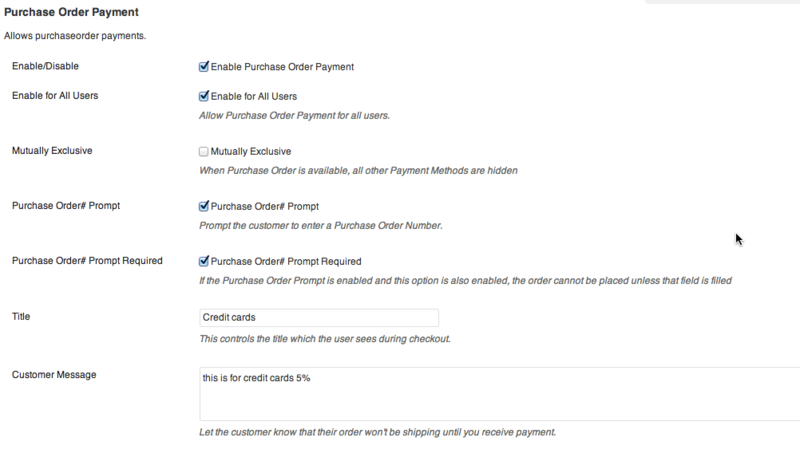 You may wish to force your customers to use the payment gateway by selecting “mutual exclusive” which will hide all other payment methods at checkout (but will be available when you’re ready for them to actually pay). Otherwise, you can make all methods available so your customer can choose to defer payment – depending on your particular business model. How does this PO plugin differ from the one offered at Woocommerce.com? We released our PO plugin about a year before theirs was released, and theirs is still quite basic. It includes a PO Number field, and that’s it. 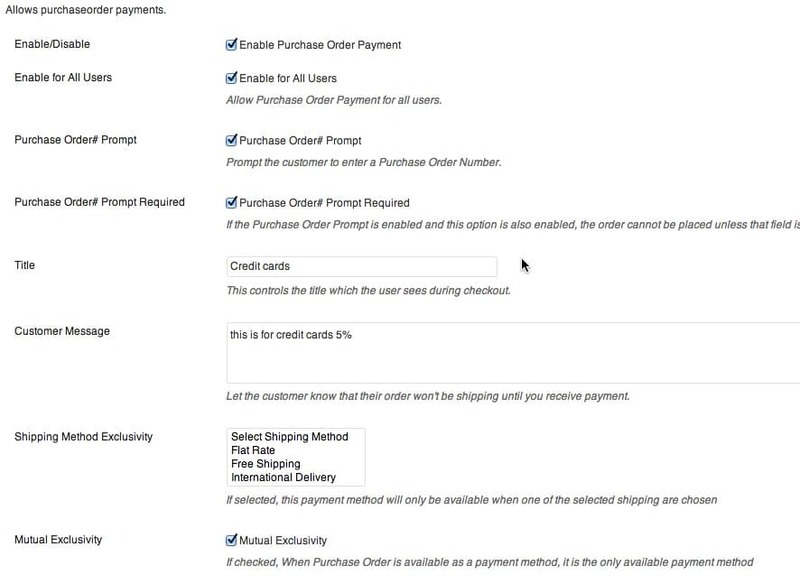 When the customer checks out, receive an order confirmation email like normal, but a note is displayed indicating that the order hasn’t been paid for yet (this note is configurable in the Customer Message field). At this point, the order status will be On Hold. 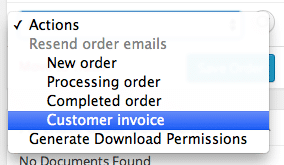 When you are ready for the customer to pay, you would change the order status to Pending (note: not Processing), save the order, and then resend the invoice email. 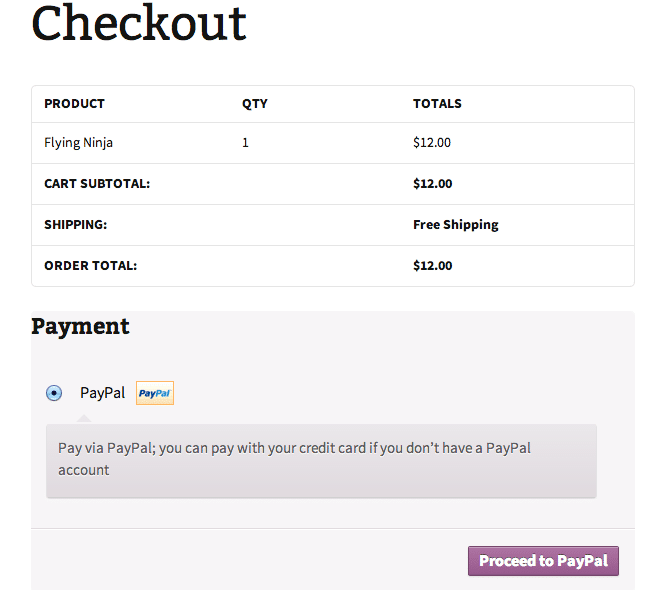 Upon clicking the link, your customer will be taken to a pay page, which looks similar to the checkout, except that all of the information is in place except for the payment method. All active payment methods will be available here Except for the purchase order payment gateway. 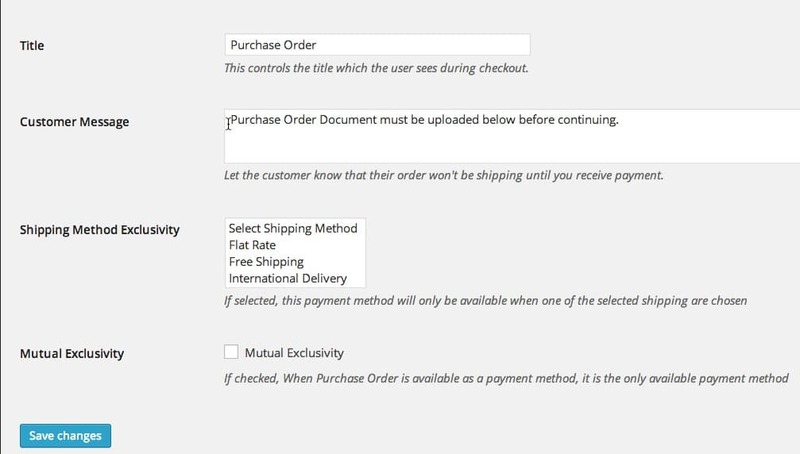 On the other hand, you may want to only have Purchase Order available for specific shipping methods – This requires that you also purchase the Shipping Filter Add-on . You can use CTRL (or command on a Mac) to select multiple options – all available shipping methods are selectable here, though you wouldn’t be able to differentiate between UPS ground or UPS 2nd day, for example. I’ve changed these fields from the defaults to illustrate what corresponds to what The document upload label field is, of course, only available on the Shipping Filter w/ PO Upload Edition. Please note: if you’re looking for more options, or a different solution entirely, I can either build it for you or point you in the direction of an exiting product that will.